I don’t remember the real estate agent mentioning roofquakes as one of our house’s features. 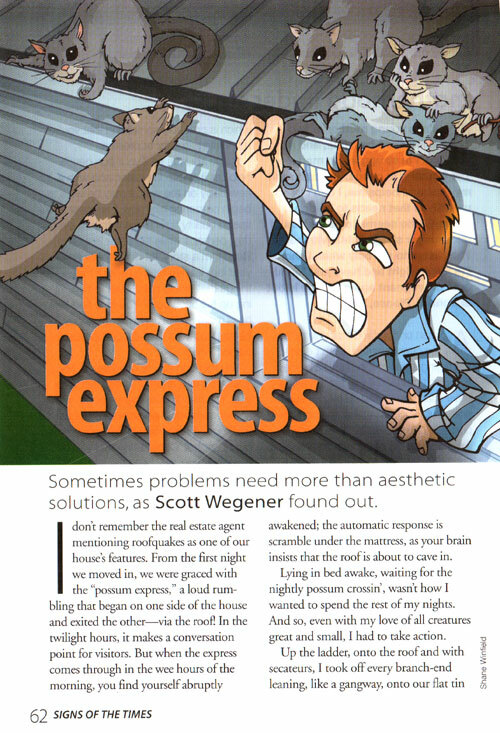 From the first night we moved in, we were graced with the “possum express,” a loud rumbling that began on one side of the house and exited the other—via the roof! In the twilight hours, it makes a conversation point for visitors. 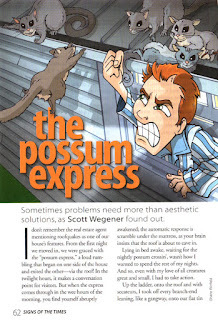 But when the express comes through in the wee hours of the morning, you find yourself abruptly awakened; the automatic response is scramble under the mattress, as your brain insists that the roof is about to cave in. "After my year (plus some) in the work-force wilderness, I was beginning to wonder if my career was of interest to God at all. "